This beautiful late summer day completely dispelled yesterday’s mood. With no particular goal in mind, I walked the length of Hillcross Avenue and into Lower Morden Lane. Turning right alongside the cemetery I took a footpath to Worcester Park, backtracked to another pointing to Trafalgar Avenue, which brought me into Cheam, and travelled left along the A24. I Slipped into Morden Park at the first opportunity and returned home to Links Avenue. 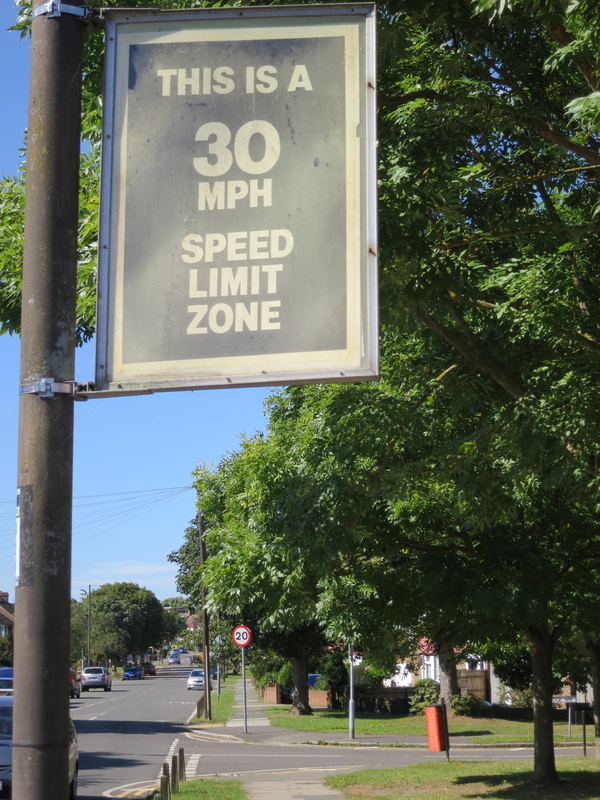 Whenever she drives along Hillcross Avenue, Jackie points out the confusion created by the speed limits in that road, which are constantly alternating between 20 and 30 mph. The changes are often obscured by trees. The proud owner of a tree in Matthew’s (not!) favourite type of garden informed me that the features displayed are obtainable in any good garden centre. The footpath runs alongside the Merton cemetery where Vivien (see 17th. July) is buried. I contemplated her grave, which I could see through the railings. In fact I had veered towards the cemetery, but realised I would be able to see what I wanted from the path. 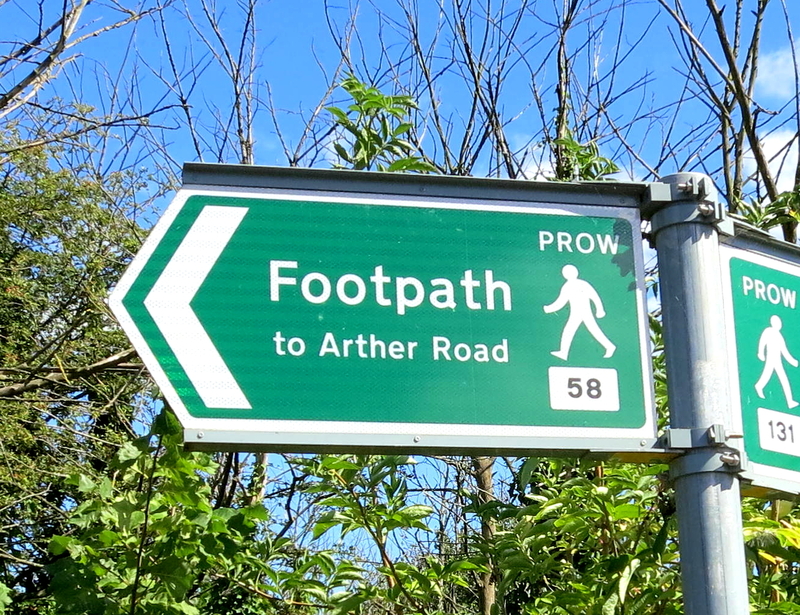 Other footpaths are signposted along this main one, providing a veritable network linking numerous streets. At point 58 in the system, I was tempted to turn off and follow one. Being unable to choose between the two streets indicated on either side of this, I continued in a straight line. Turning round at Worcester Park, I retraced my steps and took the path to Trafalgar Avenue. Accompanied by her mother, a ten-year old girl was leading a large horse. No doubt they had come from Green Lane Riding Stables which lie on the main path. The Trafalgar Avenue route is bounded on the right by a very long wall built of concrete slabs. This is completely covered in graffiti, sprayed with varying degrees of skill. A boy on a bike, dragging a panting Boxer dog behind him was being very impatient with his labouring and inquisitive pet. His cries of ‘leave it’ reminded me of my experience on 18th. June. Trafalgar Avenue consists of a row of pleasant bungalows on the right, opposite a flowing stream alongside the screened backs of other houses. As always when in Cheam, I thought of Don (see posts of 1st. to 8th. August). A wedding had taken place in the Registry Office in the park, in much more conducive circumstances than the one I wrote about on 29th. June. 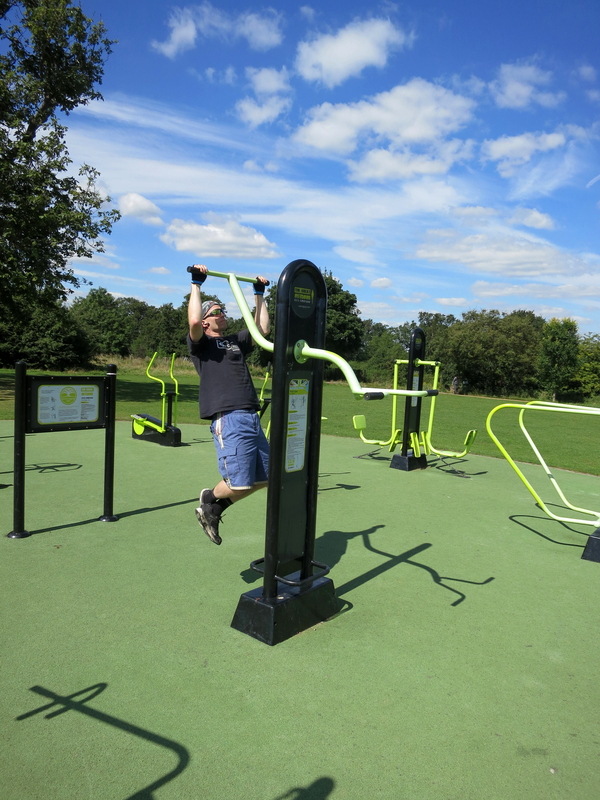 The facility provided by the Great Outdoor Gym Company was being put to good use by a young man. Waiting until he was taking a pause between circuits I conversed with him about the relative merits of the modern equipment and the barbells I had used in my twenties and again in my thirties and forties. He invited me to have a go on the bench press. I pleaded age and infirmity. In my twenties I had used the earlier YMCA building in Wimbledon. When Matthew and Becky were small and visited us in Soho, I would take them to the Jubilee Sports Hall in Covent Garden for them to have fun on the trampoline. Seeking an activity for myself, I chose to pick up weights again. The hall’s availabilty as a sporting venue was under threat, and, as part of the campaign to preserve it, a Chinese photographer produced a superb set of blown up illustrations which lined the entrance staircase. I featured in one, pushing up a bench press. Michael’s friend Eddie, was playing football in another. It was in this hall that I played my first game of Badminton. An ungainly pit-a-pat performance. I happened, rashly, to mention this to Carol Elstub, my deputy at the time. She told Ken Coleman, one of the Assistant Directors of Social Services. Ken, she said, played Badminton. She told Ken I played Badminton. She flattered me. A game was arranged. Ken turned out to be a Middlesex County Coach. Never mind, he taught me the game. We played regularly for some years. I would never beat him, but I did often manage to make him angry with himself. Our games took place in Queen’s Park Jubilee Hall, a short walk from my office. This particular venue is bound to be mentioned again. Illustrating his sparkling wit, Matthew tells a great story about his adult days in the gym. One of the other users, rather full of himself, proudly flexing his pecs, boasted: ‘look at these. Himalayas’. Quick as a flash, Mat crossed his forearms above his knees, one of which he grasped in each hand, and asked: ‘what are these’. His companion had no answer, so my son provided it. ‘Pyrenees’. I made a sausage and bacon casserole for this evening’s meal. This was consumed with the aid of three glasses of Terres de Galets Cotes du Rhone 2011, bottle number 71041, in my case; and, you’ve guessed it, a glass of Hoegaarden in Jackie’s. The bacon was Sainsbury’s cooking bacon which we can thoroughly recommend. All other ingredients, including the vegetables, courtesy of the excellent Lidl’s. This store is, incidentally, introducing Polski Smaki, or the taste of Poland, from 6th. September. If anyone has any ideas of how to avoid continually dropping the nutmeg, whilst grating it, into the mashed potato, I would be pleased to hear from them. Today’s tramp was terribly tiresome. Having often noticed, on my usual Colliers Wood walk that the Wandle trail allegedly continues on to Wandsworth, I decided to take that path as the first stage of my journey to Waterloo to meet Tony. Crossing Colliers Wood High Street, the signs led me on a meandering route, the first mile or so through uninteresting side streets populated by rather ugly modernish housing. Eventually the road crossed the Wandle and I could pick up the trail. This was a dismal and windswept winding wander on a dull and windy day. I have no idea of the distance travelled, because, with very few exceptions, each milestone gave the same number of miles. 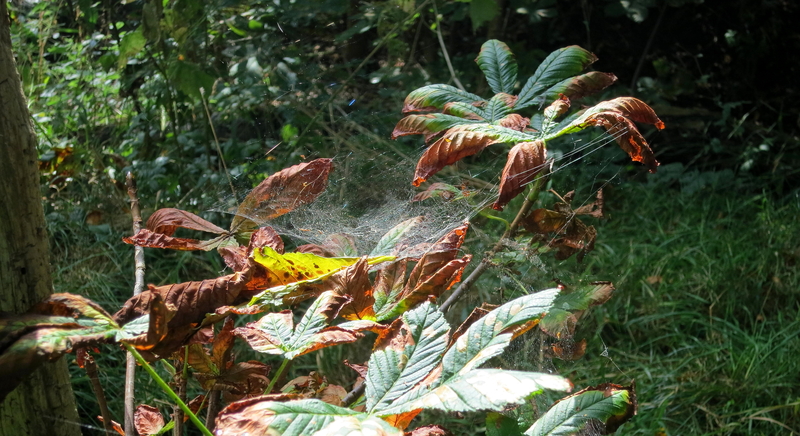 The tangled undergrowth everywhere bore evidence that summer is almost over. Weeds were brown and parched. Buddleia was similarly dry, colourless, and scorched. Blackberries were almost completely ripe. 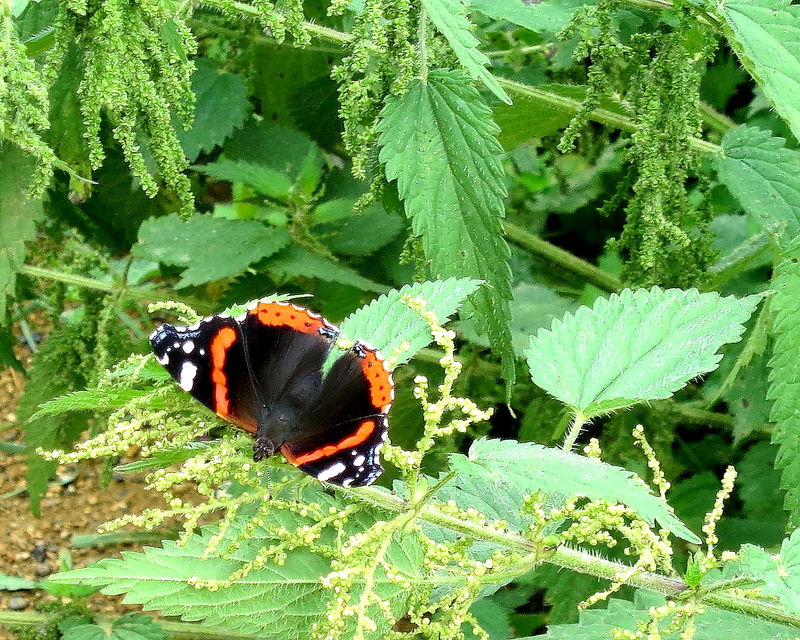 Nettles and brambles were rampant, and convulvulus choked everything in its grasp. An occasional fluttering butterfly and one hardy honeysuckle bravely brightened the withered Wandsworth stretch of the river. Paths were often overgrown. Birds, if there were any, were silent. All that could be heard was the wind whistling through the trees, except when that was drowned out by the roar and clanking of industrial machinery. 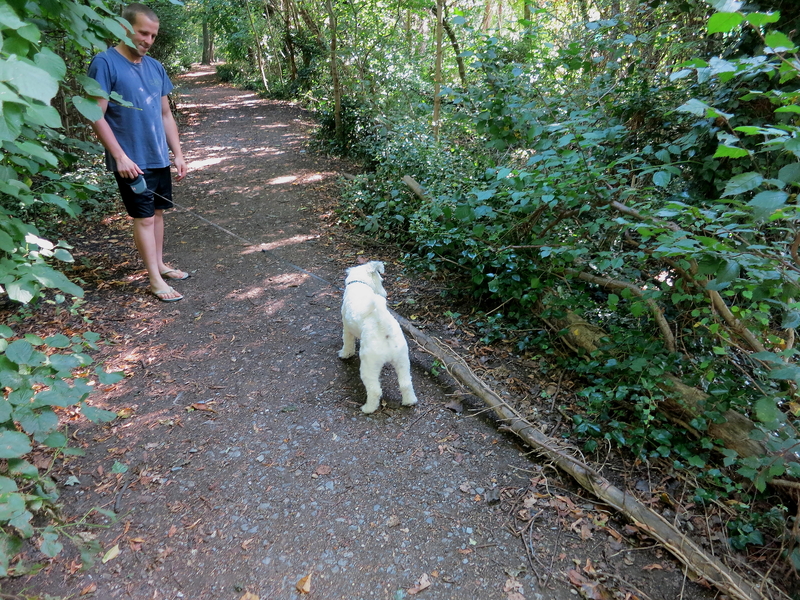 An Irishman and his dog, making their way painfully along the narrow path, stepped aside, risking being stung, because, the man said: ‘you are quicker than me’. As I passed, and thanked him, I pointed to the ancient Labrador and commented: ‘you are being held up’. ‘Yes, me legs are holding me up’, he replied. 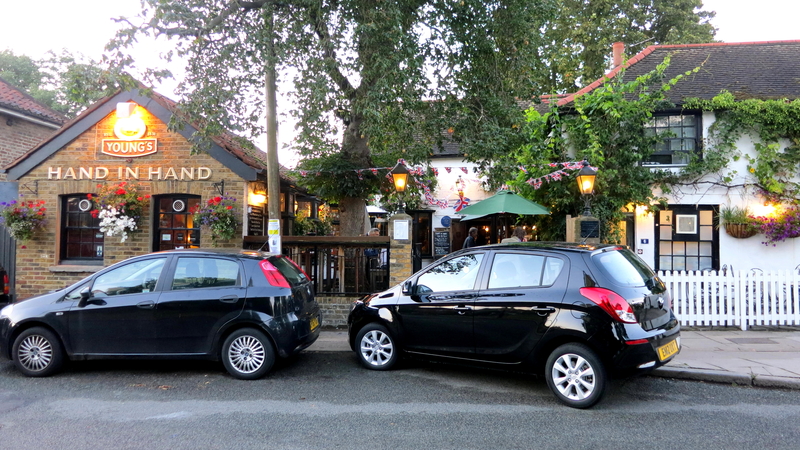 After a while I found myself in Earlsfield, where I encountered the first long straight road. Magdalen Road, SW18, is an uphill stretch bounded for most of its left hand length by Wandsworth Cemetery. Even the cyclist who brushed past me on the pavement was using his lowest gear. Consequently his legs were going like the clappers, but his speed was slow. 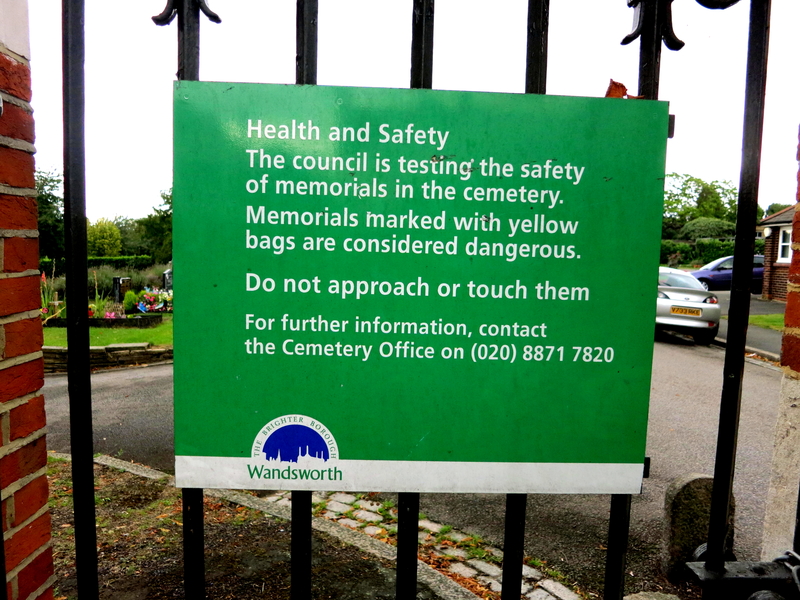 A notice outside the cemetery seemed to bear a zombie warning. This put me in mind of Stanley Spencer’s memorable painting, ‘Resurrection in Cookham Churchyard’. An effort had been made to brighten up the heavy, sombre, facade of Wandsworth Prison. It didn’t really work for me. From Wandsworth Common I made my way to Clapham Junction where I boarded a train, reflecting that I could have done so at Earlsfield. As I sat on a bench in Waterloo Station, eating a pasty whilst waiting for Tony, a pigeon at my feet adopted the posture of a hopeful dog. It had a great deal of trouble swallowing the one piece of crust I did drop. Rather like a dog with a long stick held crossways in its jaws, the bird tried twisting its neck and rapidly opening and shutting its beak. This didn’t work. When It tried using a claw it almost toppled over. 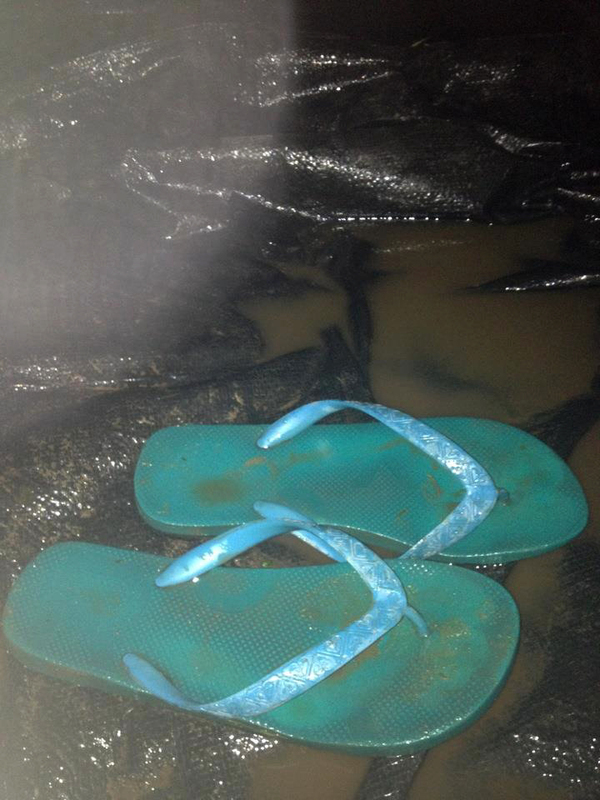 In an effort to avoid a young woman’s feet it flew off. I didn’t notice the crumb drop. It may be stuggling still. The young purple-haired man sitting next to me sucked his thumb continually as he studied his mobile phone. And he’d already eaten a Macdonald’s. At long last he found someone to talk to. He explained that he had just had to spend a week in the same bedroom as a girl without being able to touch her. He didn’t mention whether that was 24/7 or just the nights. His listener could not possibly have any idea of how hard that was. Perhaps that’s why he needed a dummy. Once he’d finished speaking, the thumb went back in the mouth, until he was joined by two other equally colourful young gentlemen. Hugs all round ensued. I am now beginning to realise where sitcom scriptwriters source their material. The Paralympic Games traffic was really hotting up. Brightly clad marshals were adept at identifying those who needed direction, and providing the necessary service. Transport police were in strong but largely discreet evidence. Except for the two, carrying automatice rifles, who were cheerily chatting to customers on the concourse. Mostly elderly ladies who didn’t seem to be terrorists in disguise. Tony and I, as usual spent an hour or so in the Archduke bar underneath the railway arches. Having heeded the weather forecast, I sweltered under an albeit open raincoat on my usual walk to Colliers Wood en route to Carol’s in SW1, then to Norman’s in Harlesden. Later, I was grateful for the coat’s protection. Outside a Halal shop in Morden, a delivery man, obviously having risen very early, was indulging in a welcome stretch. Perhaps my smile was not as kind as intended, because he responded similarly with arms still fully akimbo. This meant he exhaled rather earlier than he would have liked. In Morden Hall Park, a woman was walking two ‘Churchill’ dogs. Or maybe one dog and a stunted Martin Clunes. For the benefit of my non-UK readers ‘Churchill’ is a model animal in an advertisement for insurance who carries on banter with the fine, humorous, actor, who has chops rather like his. A mass of mangled slug corpses suggested that slugs are not yet extinct in the park. 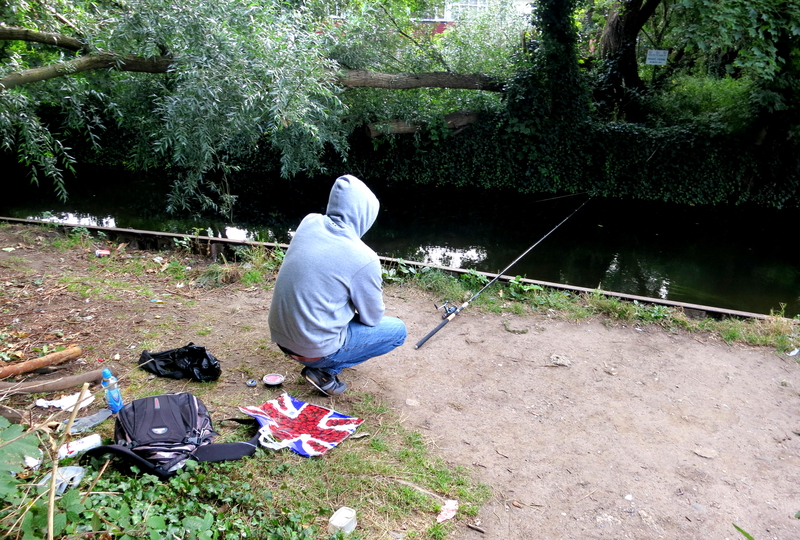 Along the Wandle, a solitary Eastern European fisherman was trying his luck. He thought his photograph ‘very nice’. A family of ducks was surveying the scene. Carrying bags of shopping was a man sporting a magnificent comb-over. Two women on Boris Bikes (see 19th. June) sped weaving through the tourists over the stone sets in the precincts of Westminster Cathedral. These bikes, sponsored by Barclays Bank, are, in my view, a rather doubtful innovation of the Mayor of London, with the idea of getting more people on bicycles in Central London. Speaking with Carol about fire alarms reminded me of a burglar alarm on the corner of Shaftesbury Avenue when Jessica, Michael, and I lived in Horse and Dolphin Yard in Soho. On the outside of a shop, very close to our bedroom window, this device was constantly being set off. Once activated it would not desist from ringing. The police could never either trace a keyholder or get one to come out and turn off the noise. One of their problems was that the establishment often changed hands. On one occasion when it was doing my head in, and the police were unable to help, I decided to take it off the wall. Armed with a screwdriver and a hammer, I climbed a ladder, hoping no-one was looking up my dressing gown, and set about it. This was a very complicated procedure in which I had to completely dismantle the offending article and prise apart some wires before the ringing would stop. Fortunately I had no need of the hammer. When I returned to bed, hoping to sleep, Jessica suggested that I should tell the police what I had done. I did. Five minutes later I was arrested. On being escorted into the police station I was greeted with calls of ‘ ‘ere, that bloke rings a bell’, and ‘don’t get alarmed mate.’ I think it was the highlight of their evening. The sergeant informed me that they were not prepared to charge me with criminal damage, but they had to give the owner the opportunity to do so. And I hadn’t actually damaged anything. I’d carefully collected up all the bits. I’d have had more sleep if I’d stayed indoors. Unsurprisingly, the owner was not interested in pursuing the matter. Some while later, intent on repeating my misdemeanour, I was halfway up the ladder when a policeman politely asked me what I was doing. When I told him, he said I wasn’t. ‘Oh, OK’, I replied, and went back to bed. Eventually I tried a more subtle solution. By this time the outlet was selling clothes. After a particularly bad three nights, I persuaded a shop assistant to give me the phone number of the current owner. The next occasion on which our sleep was disturbed, I telephoned him. ‘Whoooaahr’, said I, with a sharp outlet of breath, ‘I think you’d better come out here’. Now he was alarmed. I went on to tell him that his shop had been burgled. In their haste to get away the perpetrators had strewn jeans all over Shaftesbury Avenue. Naturally, in telling this little white lie, I remained anonymous. We were never troubled again. Our neighbours were quite grateful. I was a bit early for Norman, so I sat for a while on the middle of three benches outside St. Mary’s Church (see 19th. July). An African man, on the left hand bench was, on his mobile phone, supported by quotes from the bible, expounding his philosophy on the nature of women and the problems they cause. I wondered what the two Muslim women on the right hand bench would have made of this. 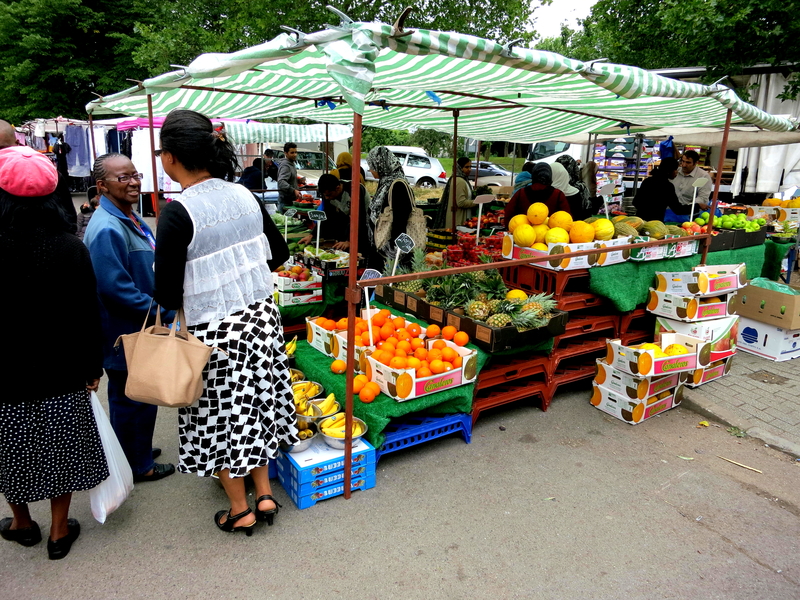 Always a colourful and thriving affair, Wednesday is Church Road market day. 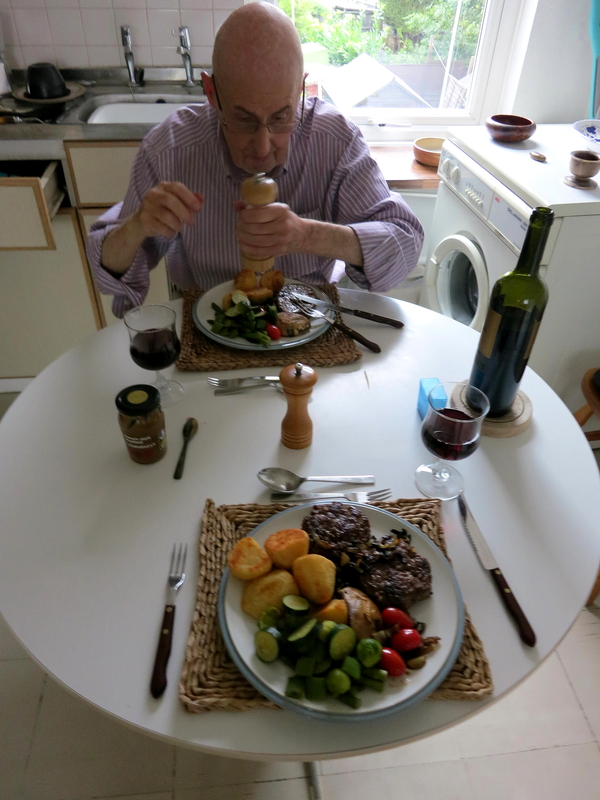 Norman provided a lunch of rump steak beefburgers, followed by summer pudding. We shared a bottle of Melini reserve chianti, 2009. This evening I took a 93 bus to The Rose and Crown in Wimbledon Village and walked across the common to the Hand in Hand in Crooked Billet to meet Michael. Fifty-plus years ago, when I drank there with my own father, this greatly extended Young’s pub was a small spit and sawdust independent establishment run by four sisters. As I was a little early I wandered across the green to look at a grand house into which, some fifty years ago Dad and I had moved a family. In the garden was a man, probably in his fifties, having a cigarette. I told him about the removal, in particular that we had, with a piano we were bringing in, damaged a skirting board at the bottom of the stairs. This man told me his family had owned the house for about that length of time. On this splendid late summer morning I took myself, via Martin Way and Cannon Hill Lane, to Cannon Hill Common. In Maycross Avenue an elderly couple were struggling to get a large canvas bag into the back of their car. I crossed the road and volunteered to help them. The bag contained pruned branches. As I easily lifted my end into the vehicle, the man exclaimed: ‘Blimey. You are worth ten of us’. Given that they were probably no older than me I counted my blessings and told them how I had spent my weekend. 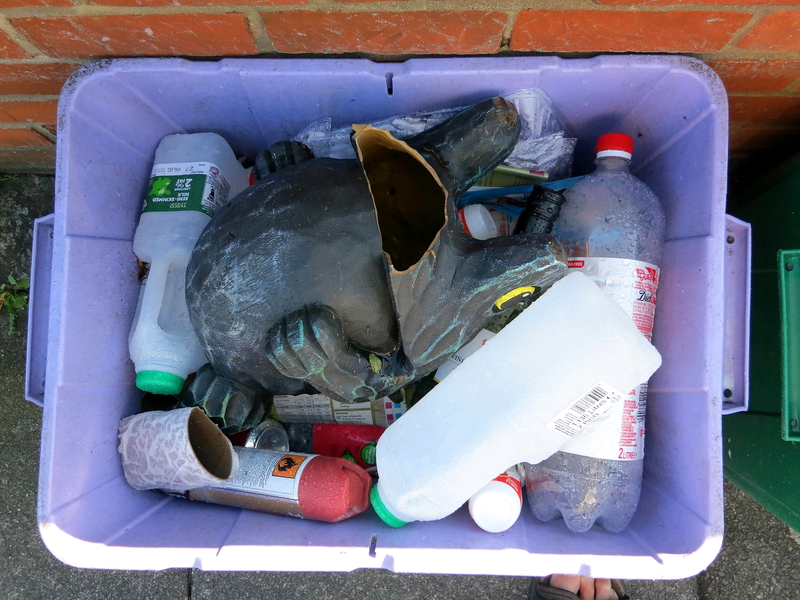 A frog had taken refuge in one of the recycle bins awaiting collection. There was a lot of fishing going on in the lake, and Alan William Marshall’s memorial bench (see 31st. May) bore a fresh vase of crisp roses. There are now official notices informing piscators that they must be members of the eponymous club in order to fish. I didn’t ask anyone whether they belonged to The Wandle Piscators. 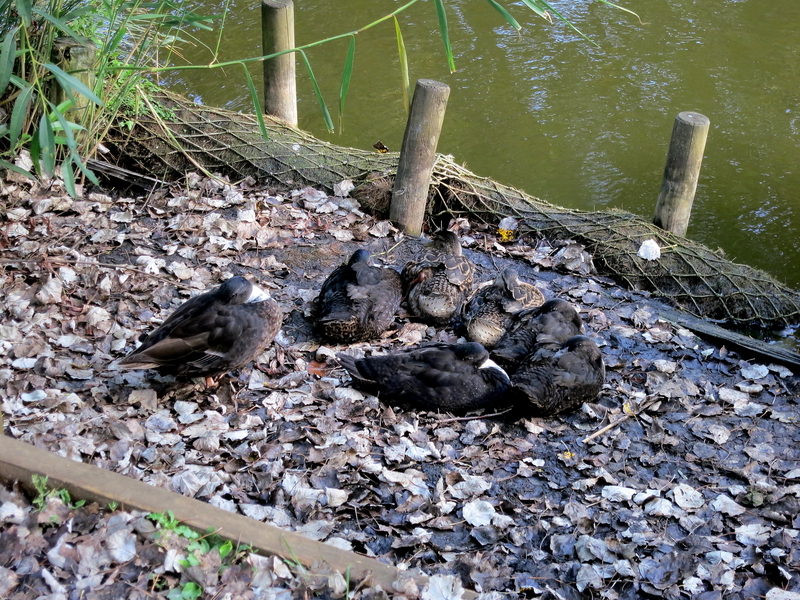 Numerous ducks were swimming on the water, and a group were having a camouflaged rest on the bank. There were clearly a number of grandparents fishing or feeding the ducks with small children. This took me back to one day when Emily and Oliver were both under three. I cared for them for the day. Wondering what on earth I was going to do with them all day, I readily agreed. As it was a pleasant afternoon I took them to a playground and spent the time pushing swings and trying to keep my eyes on both of them at once. I have to admit I looked at my watch every half hour or so until the time I could give them back. Only, joking, kids. Gramps having a laugh. On another occasion, when Oliver was about three, I had a laugh with him. I entertained him for a good hour without having to move from my chair. He had one of those small bows with rubber tipped arrows, and fired it at a white spot on the wall. Soon the spot began to move around the room, giving him a moving target. He occasionally hit it, when it momentarily became stationary. What I had noticed was that the white spot was the reflection of my watch face. The smallest movement of my wrist was enough to provide hours of jolly fun with the least effort from me. For as long as the sun was at the appropriate angle, anyway. Ten month old Barney was also being babysat. His carer was calling him the stupidest dog in the world because he was trying to lift half a tree. This reminded me of the time when I, too, had bitten off more than I could chew. At a zoo in Australia in 2008, a jam-packed crowd was peering at a gorilla. What I thought was a small boy in front of me couldn’t see a thing. I asked his mother if I could lift him up. They both readily agreed. Unfortunately the lad turned out to be very fat, and I wasn’t as strong as I had once been. I grasped him under the arms intending to hoist him onto my shoulders. I couldn’t lift him further than my chest. I settled for a bear hug at that level. I had to grip him so tightly I think he was probably very relieved when I put him down. I was certainly rather embarrassed. At least he saw the gorilla. Maybe I was lucky that the bag destined for the municipal dump earlier only contained sticks. Mind you, a thorn sticking through the canvas did leave its mark on my hand. 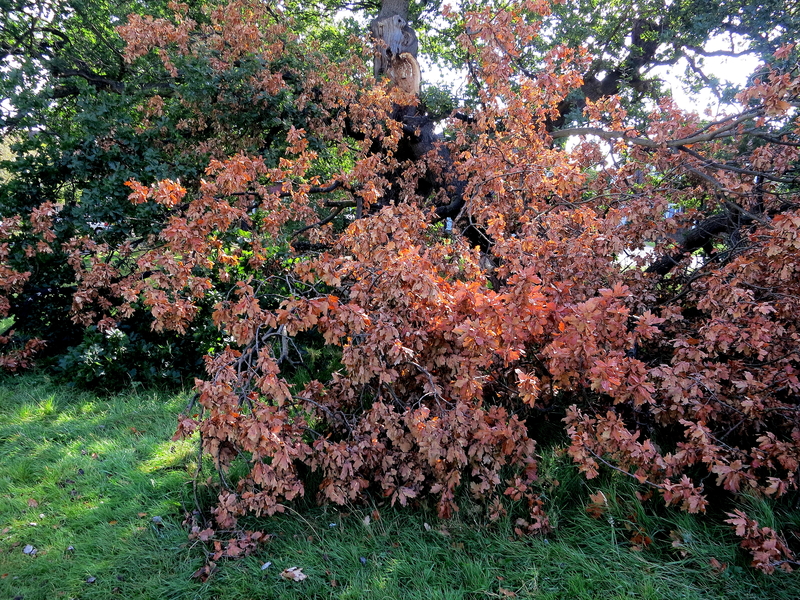 Some of the trees, including a mature oak, had been damaged by the strong winds we’ve experienced this year. The tree bore a large scar and had lost a huge branch, giving the scene an autumnal appearance. This reminded my of the centuries old Major Oak in Sherwood Forest which we sometimes visited when Sam and Louisa were young. The long low limbs of that tree are now propped up by struts, and the area is fenced off. This afternoon I began reading ‘Count Belisarius’ by Robert Graves. Today was dull, but the rain largely kept off, and we were able to continue with the gardening. Jackie helped me with the preparation of the scented bed. What I pruned off or dug up, she cut up and bagged up. All in readiness for the next bonfire. 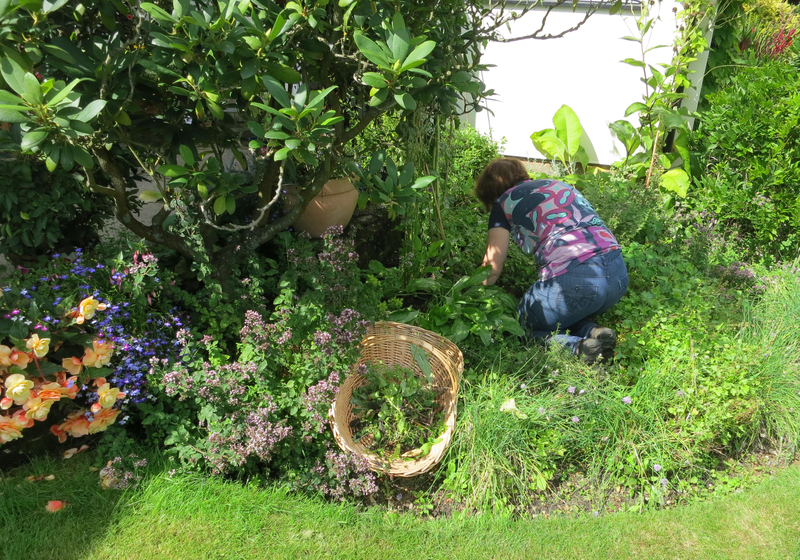 This afternoon she carried on with her own projects and Elizabeth with the weeding of the herb bed. I managed to get far enough with the new bed to compost the beginning of it so Jackie could put some plants in. We had found a number in pots covered by the undergrowth and forgotten. In particular there were three of tradescantia (outdoor variety) destined for Mum. It was a good thing that Jackie decided to check them over, for each one contained a thriving colony of red ants. As she laid them out on plastic sheeting in an effort to persuade the ants to seek a new home, she suggested I didn’t sit on the edge of the table unless I wanted ants in my pants. Noticing the absence of our friendly robin, we recollected that we hadn’t seen it for a few days. Jackie had, however, unearthed an unidentifiable avian corpse from a flower bed. 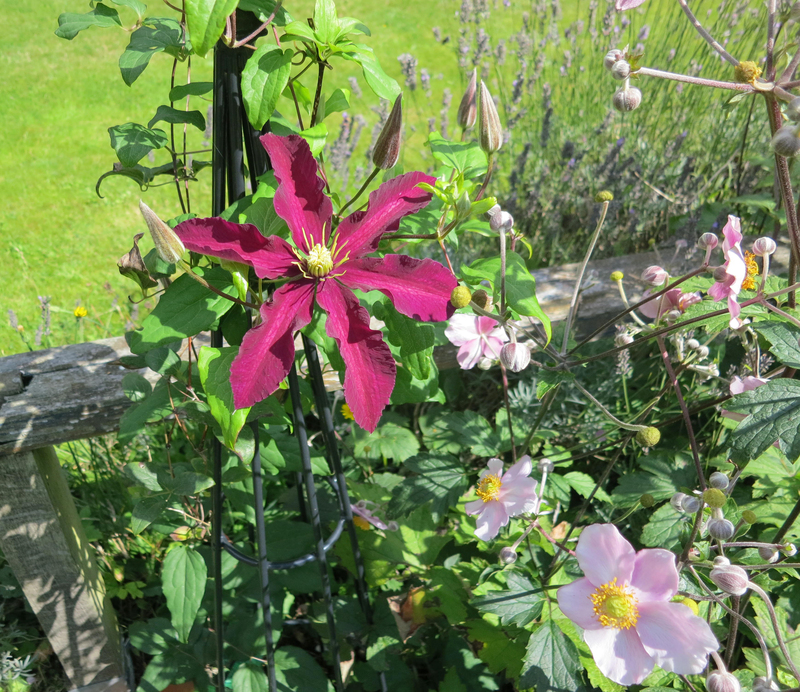 We have got to the stage where we are beginning to think of garden adornments, other than the ubiquitous hanging baskets. 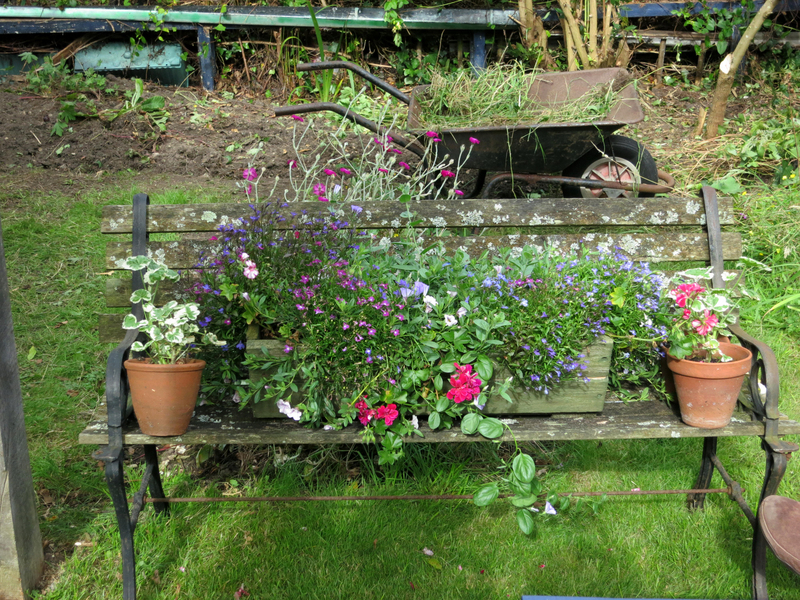 Rickety benches which could not safely hold a human, make a good plant table; as does one of Elizabeth’s painted treasures. Moving the little girl mentioned yesterday was just a start. My target for today with the new bed, was to reach a row of grass cuttings which had been laid alongside the laurel boundary hedge a year ago. 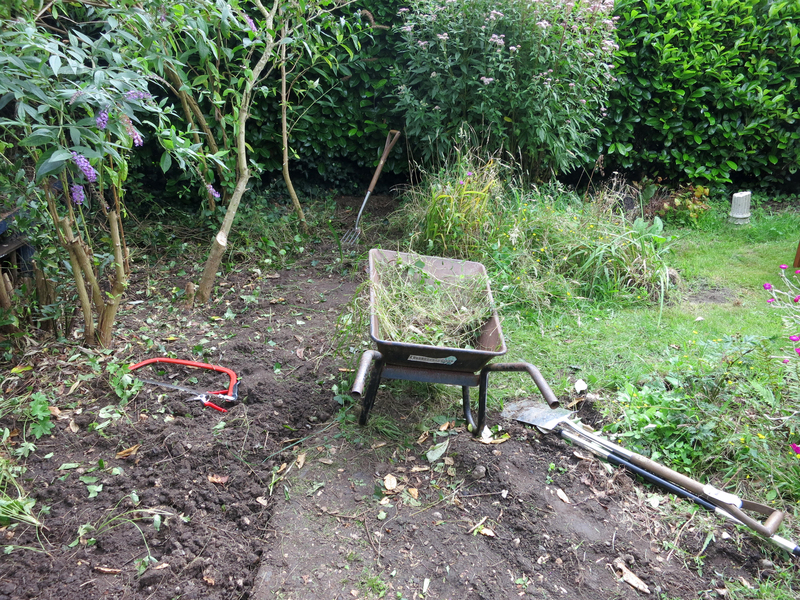 This was a nice clear bit which, with any luck, would have broken down into compost, and kept the weeds away. En route to this heap, I tackled the additional menace of lilac suckers which had to be uprooted. I wasn’t too worried about the long trailing stems of honeysuckle and ivy which could be pulled until resistance was met, then dug up where they had taken root, then on to the next rooted bit. The ivy was, however, getting thicker-stemmed the nearer I got to the laurel. All right, I thought, I will find it bound around the laurel trunks, and have to set about removing it. Well, I didn’t get that far. I did reach the hedge, but will have to leave eradication of the mature ivy until next week. This is because the lovely warm, rotting, packed chunks of grass cuttings had provided a perfect incubator for little pure white tendrils. Lots of healthy young ivies. 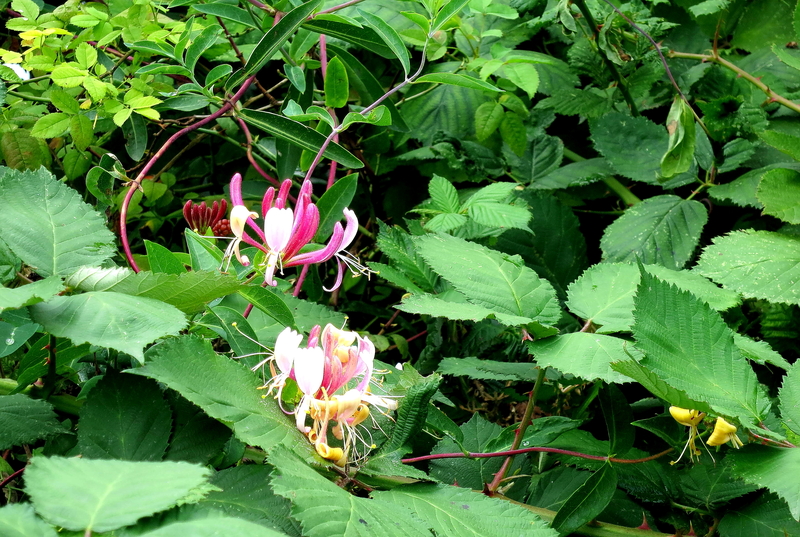 There are three different unwelcome plants with which I have done battle in three different gardens. 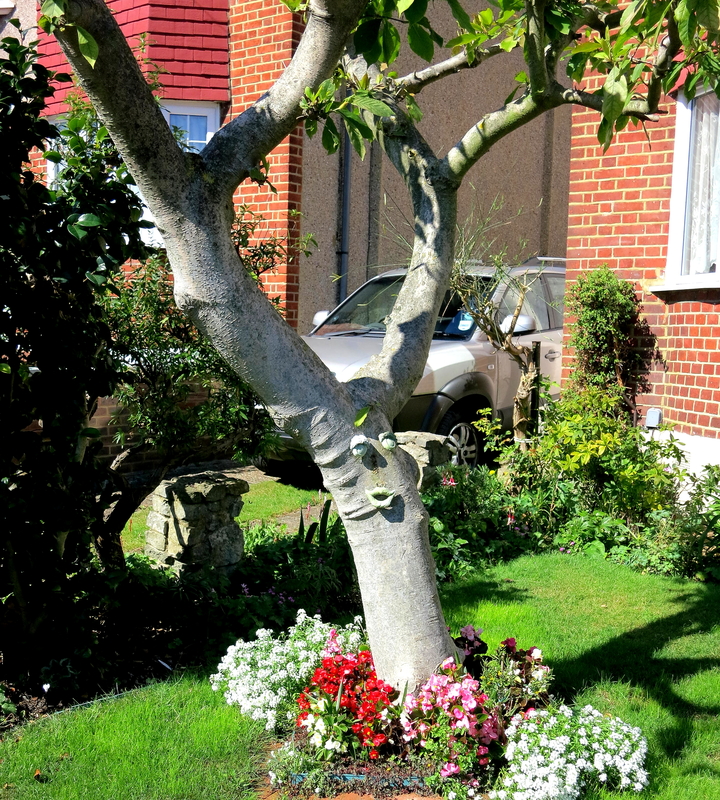 Bindweed in Stanton Road during my childhood; ground elder in Lindum House in Newark; and ivy in Sutherland Place, W2. What they all have in common is that they send out long tendrils which take root whenever they feel like it and produce a new plant, and so on ad infinitum. 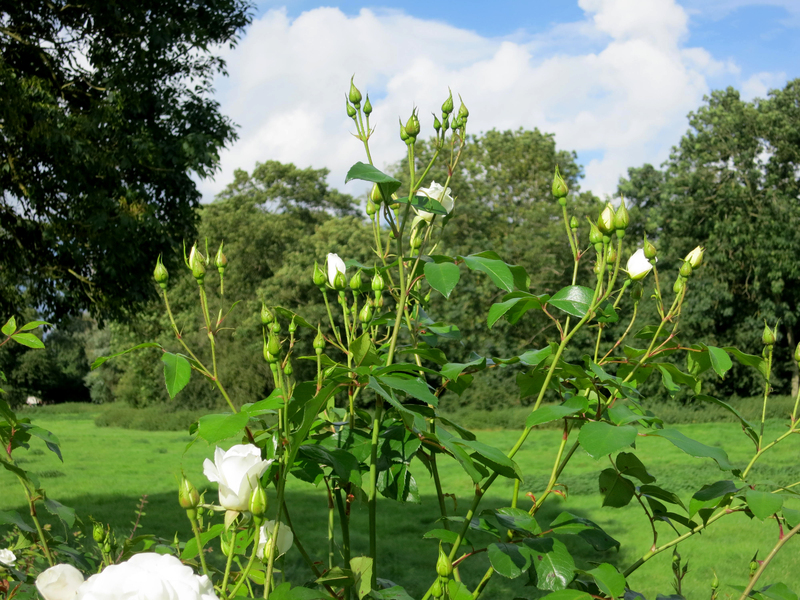 The other property they share is that of being able to reproduce themselves from the slightest little rootlet or stem left behind by the most careful of gardeners. 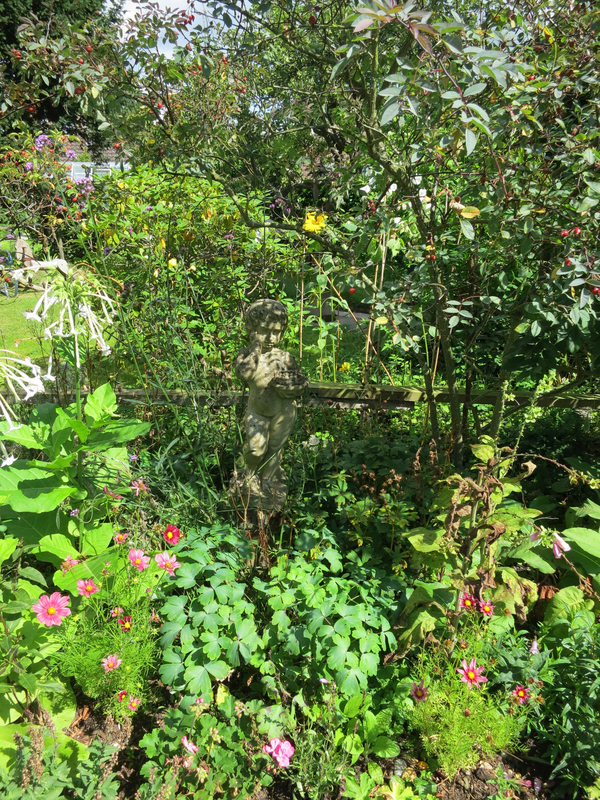 I never did get rid of Stanton Road’s convulvulus; it took sixteen years to rid the Lindum House vegetable garden of ground elder; it took two weekends to clear Sutherland Place of ivy. 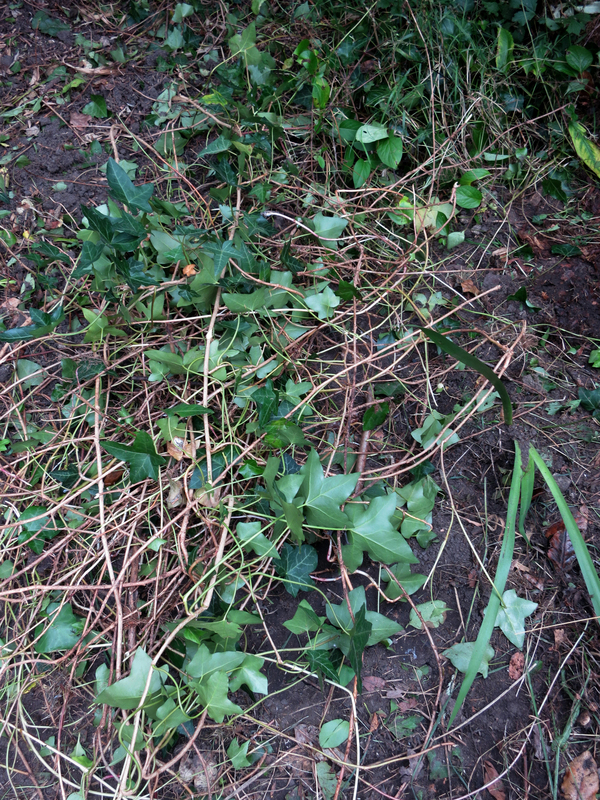 Ivy is the toughest of all these to remove, as, if undisturbed, it can grow extremely thick stems which cling to branches and walls and are sometimes impossible to prise off. But it is not as sneaky as the others, for its tendrils remain overground. It gives you a challenge and a chance. The little white tendrils I had discovered today, would eventually have emerged into the light. 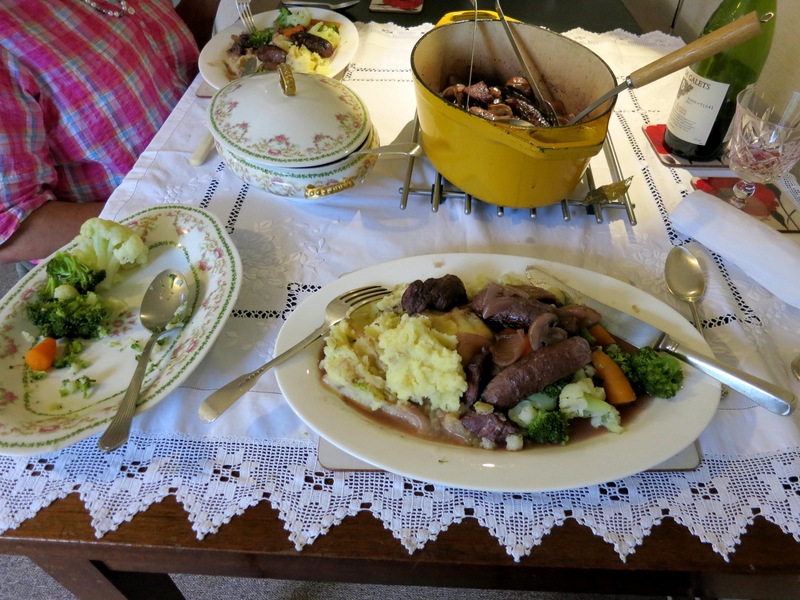 This evening last night’s chicken bolognese was served with vegetables, and we had the same puddings and wine or beer according to our taste. Afterwards Jackie drove us home whilst I dozed by her side. Today, much cooler and less humid than last weekend, was a very pleasant day for gardening. Jackie, proud of the sweet peas she had grown from seed, continued with her planting and weeding, whilst I continued with the new bed. This time, my main problem was the ivy. Had I known just how much ivy there was concealed in what was once perhaps a shrubbery, no way would I have expected to finish this task so quickly. Elizabeth and I had, in the spring, cleared a great deal of ivy from the laurel hedge at the front of the house. But this was nothing compared to Sutherland Place, which I mentioned yesterday. 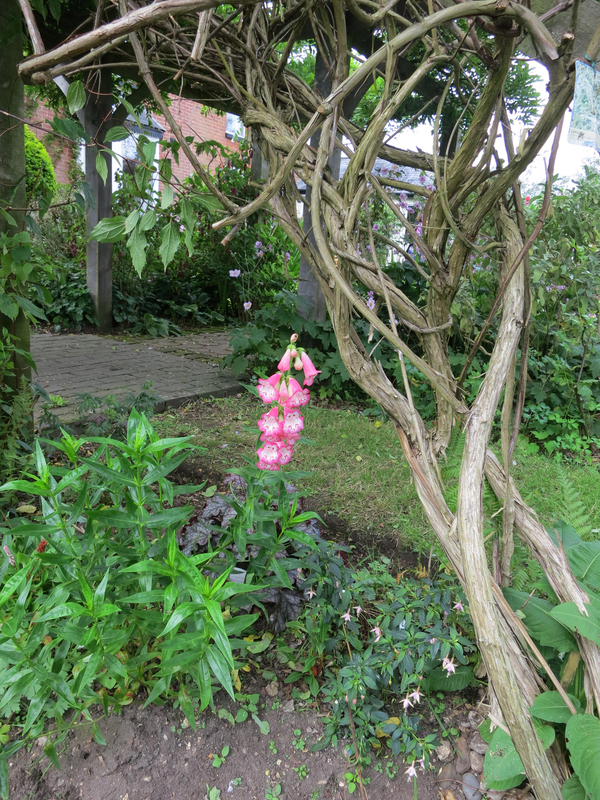 When I first took up my tenancy there in 2008, no-one had entered the small London terraced garden for 20 years. The ivy had taken over. It took me two complete weekends to clear it. 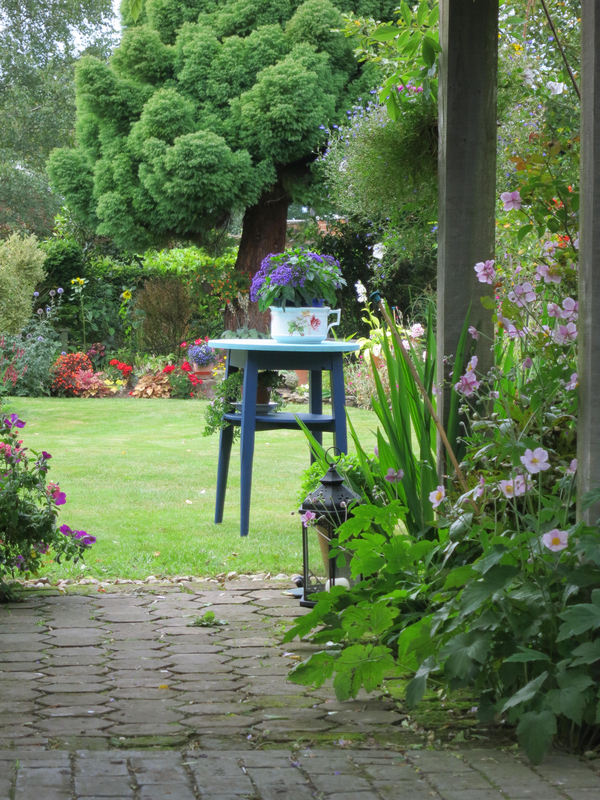 Jackie also mowed the lawn whilst Elizabeth, who has been unwell recently, weeded the herb bed. Some years ago, a statue that Jacqueline had given Elizabeth, lived on the grass. This little girl was moved around from site to site as the mowing required. Last year, thinking that she really deserved a permanent home of her own, we moved her into a flower bed. Now she stands on the remains of one of the brick pillars that held up the former pergola. Mowing can now be undertaken without having to shift her, and she is left in peace to survey the activity. Later Elizabeth mowed the front lawn. I got a bit further past halfway in digging out the new bed. I have never been one for camping, or barbecues, for that matter. I like my home comforts, and cannot see the fun in struggling to light, and keep alight, an outside facility when there are perfectly good ovens and grills in the kitchen. Yesterday I described Wolf and Luci’s caravan, which seems to me a pretty good method of going camping. Louisa and Errol and their daughters are currently being flooded out of their tents, but they think that is all part of the fun. So, why am I going on about the outdoor life? Well, Barbara made a witty comment about camping after reading yesterday’s post. This reminded me that the last time I went camping was by accident. On 28th. May I wrote about the fundraising walk I had done in the summer of 2003 in support of Sam’s Atlantic Row. 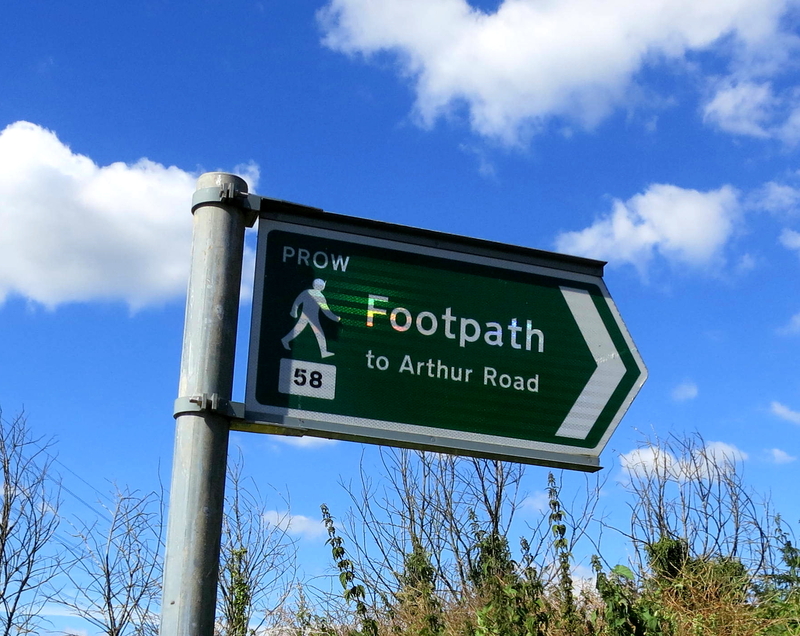 Walking 215 miles in 11 days, as that post shows, was only the half of it. What I didn’t mention in the Nettle Rash story, was the ten nights involved. Sam’s friend James was accompanying him on the boat. The vessel Sam was to spend 59 days alone in, rowing across the ocean, was purpose-built. There was therefore a small cabin on board. Designed for one, it was going to have to accommodate both Sam and James. As I have already stated, I like my comfort, so the plan was that wherever we stopped at night, we would find me bed and breakfast accommodation. That worked pretty well. Most of the time. The two occasions on which it didn’t would have to be consecutive, wouldn’t they? Fortunately the nights were warm. Fortunately James had brought a small tent which he was generously prepared to lend me. Unfortunately there was no mattress, no ground-sheet, and no sleeping bag. Because we hadn’t considered the possibility that we might decide to stop in the middle of nowhere. On the first occasion, we managed to find me some sort of camp-site with tents, but no bedding of any sort, and latrines which I was quite unprepared to use. I slept on the hard ground. Yes, I did actually sleep. When you’ve walked as much as I had, you’ll sleep anywhere. I thought. Until the next night. This time I used James’ tent. These outdoor nights were spent in my day clothes. The place where we had pitched the tent seemed to be incredibly stony. One particularly sharp stone dug into my left thigh all night. I was just too tired to attempt to move, and desperately trying to get some shut-eye. I’ve no doubt I did sleep a bit, as is always the case when you think you haven’t slept at all. When, early in the morning, I finally decided I’d had enough, I looked for the offending stone. I couldn’t find it. Then it dawned on me. I fished in my left trouser pocket, and pulled out my bunch of keys. This evening we were joined by Elizabeth’s lifelong friend Nicki and her children Georgie and Josh. Elizabeth produce spelt spaghetti with a chicken based bolognese sauce, which was followed by coffee roulade, French apple tart, and M & S chocolate coated cornflakes. Three different red wines were drunk, Jackie preferring Hoegaarden, and the young people bottled ales. During odd moments in the last few days, I have finished writing clues for Mordred’s next Independent cryptic crossword submission. This morning, after a final bit of tweaking, I sent it off to Mike Hutchinson, that newspaper’s most accurate and humorous editor. Any further adjustment he may require will only improve it. This morning Jackie drove us to Wolf and Luci’s caravan at Hurley in Berkshire. Passing Warren Road, mentioned on 23rd. August, with Jackie’s help I realised that my memory had let me down. ‘Shern’ children’s home was not in Warren Road. That was where the baby nursery was. It was closed during my time in Kingston. ‘Shern’ was actually in New Malden. As we drove through Richmond Park I was reminded of the beauty of this ancient wooded parkland. There was quite a clear light filtering through clouds and sharpening one’s vision of the mature oaks. Cars were hampered by the myriad of cyclists on the road. Joggers abounded on the footpaths. Further on, Kew, despite low-flying aircraft, remains a picturesque village. Properties there are expensive, and much sought after. London, this vast metropolis, is in reality a series of conjoined villages, each with its own history and characteristics. 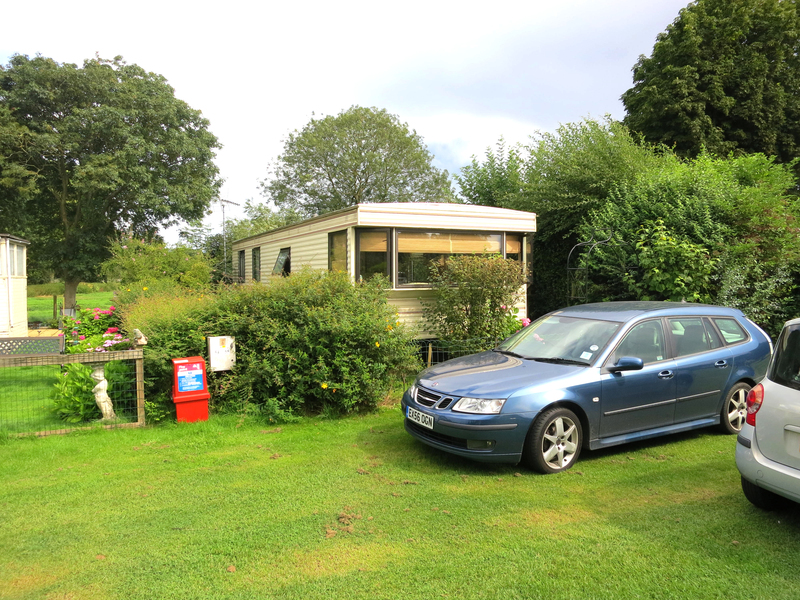 As someone who had a fairly antiquated idea of caravans, I am always impressed with the accommodation available in our friends’ second home in Hurleyford caravan park. They have two bedrooms, a fully fitted kitchen, and an ample shower room. The prefabricated building is what is called a static, in that it is a permanent fixture. 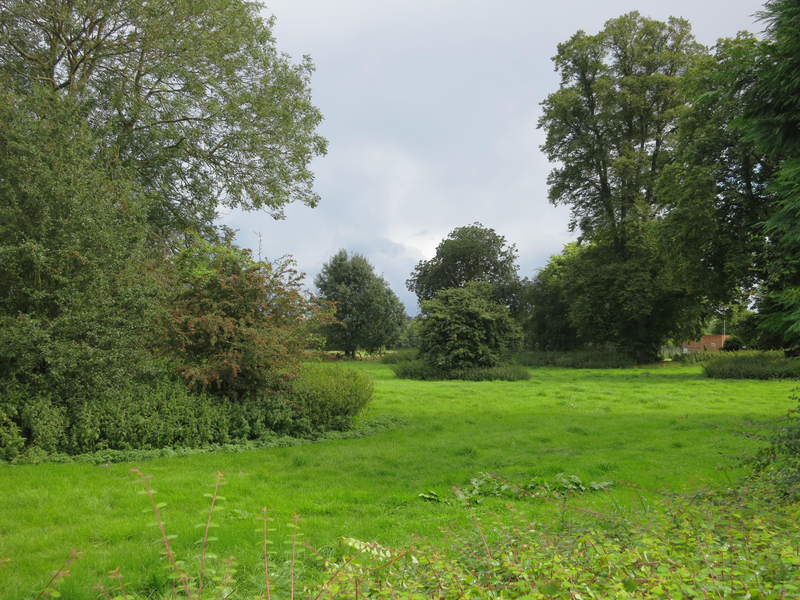 All the plots have their own gardens, and the sites overlook fields or the river Thames. Owners can be resident for only eleven months of the year; they are contractually obliged to provide a permanent address for the other month. It is an idyllic spot which was discovered almost twenty years ago by Wolf’s late, lifelong, friend Robert when he was out walking one day. 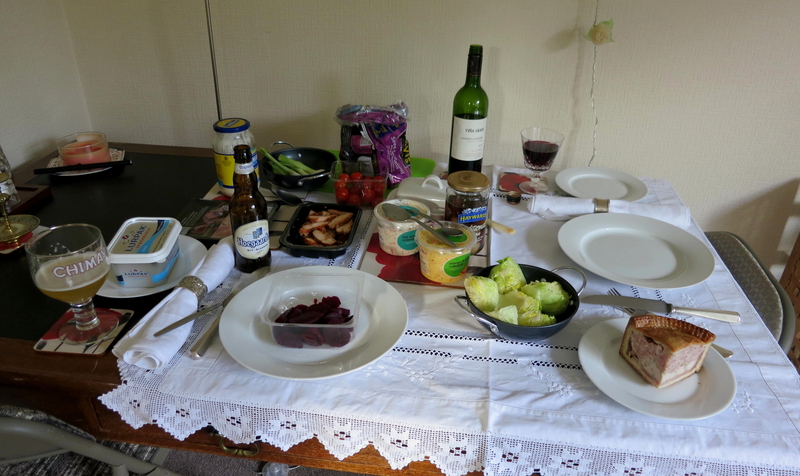 We spent the day eating delicious salads and fruit crumble prepared by Luci, with red, white, and rose wines and fruit juices; talking; escaping the thunderstorm; and managing, between showers, a short walk. The rectangular walk took us round the field that is immediately behind the caravan, and along the Thames bank. Apparently their cat, Aggie, is prone to wander. One day she came home without her collar. A day or two after Wolf and Luci had returned to their house in Clapham, they received a telephone call from a woman who had found it in a nearby hedge. This reminded me of a collar I had once found. My flat in Sutherland Place, W2, was plagued by neighbours’ cats. They seemed to think it was their territory. Boldly they walked in through the windows as if they owned the place, or simply sat on the windowsill observing me. These came from at least three sources. They were all fancy creatures. In W2 you don’t see many decently respectable moggies. Only indecently disrespectful pedigree animals who come in uninvited and scratch up your upholstery. I happened gently to mention this in passing to the owner of two of these feline intruders. She provided me with a squirt gun. In my younger days, I rather fancied myself as Clint Eastwood, but no way would I ever have beaten him to the draw. By the time I had reached my weapon, the cats were long gone. I took to chucking whatever I had in my hand at the time at any intruders, once scoring a direct hit with a loose-leaf file. Despite having to pick up all the loosened sheets, I found this rather satisfying. One morning at about 5 a.m., for some reason which I cannot now remember, I went into the sitting room of my flat. The room was empty but for a coating of long white fur all over the carpet and all the furniture. It looked like a chicken run after a fox has been at it. In the fireplace was one solitary cat collar with a bit of black fur attached to it. Sure enough, it bore next door’s address. I returned the collar to its owner, the black cat. What of the white fur? Well, there was one most exotic creature. It had a very long, completely white, coat. I had never seen it in my flat, but it often sat on the sill. I always imagined it didn’t want to ruin its hairdo by squeezing under the window. I think it was called a Norwegian. I never saw it again. ‘Murder in the lounge’, said Luci, upon being told this story. After leaving our friends early this evening my chauffeuse drove us to The Firs in West End.